MySiyum.com, a website founded by Partners in Torah with the goal of encouraging Jewish learning, announced the release of a short film about four women study partners called “Friends ‘Til the End of the Text”, aka “Friends to the End.” The film promotes MySiyum.com as a starting point to learning a Jewish text, preferably with a study partner. "Four women who had never met came together to make this promo for the largest celebration of Jewish unity and learning in the last 2,000 years...the feeling among the women during the campaign was amazing - friendly, warm, and completely in tune. MySiyum.com, a website founded by Partners in Torah with the goal of encouraging Jewish learning, announced the release of a new film called “Friends ‘Til the End of the Text” aka “Friends to the End.” The film promotes MySiyum.com as a starting point to learning a Jewish text, preferably with a study partner. The storyline of “Friends ‘Til the End of the Text” encourages everyone to learn and finish a Jewish text. Additionally, the subtext is that this kind of learning is not only for scholars or for those who have been religious their whole life. Learning is open to any man or woman who has an interest in learning more about any aspect of Judaism and is willing to make a commitment to doing so. 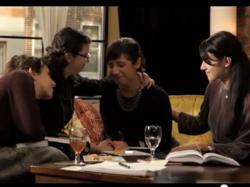 The video was filmed in Brooklyn, NY, at Bistro 1310, a chic upscale Glatt Kosher restaurant. About MySiyum.com – MySiyum.com is a project of Partners in Torah, a free Jewish learning program that pairs students from across North America with Torah ‘mentors’ for weekly study by phone about all Jewish topics. Partners in Torah supports 13,000 learning sessions per week, and has successfully engaged over 30,000 students since its establishment 15 years ago. The organization also publishes regular newsletters about the weekly Torah portion as well as other Torah-based periodicals. For more information, visit http://www.MySiyum.com.